Dr. Carl O. Helvie, a registered nurse and the holder of a doctor's degree in public health from Johns Hopkins University, was diagnosed with lung cancer in 1974. He's still around. Here are the highlights of his story. Despite every modern medical innovation, lung cancer remains a lethal disease. Lung cancer is the second most common cause of death in the United States and in many other industrialized countries. It is the leading cause of cancer death. Only about half of people who have any form of lung cancer live more than a year after diagnosis. About three-fourths of men and women diagnosed with any form of lung cancer die within two years. And only 2% of people who are diagnosed with lung cancer live longer than 5 years. 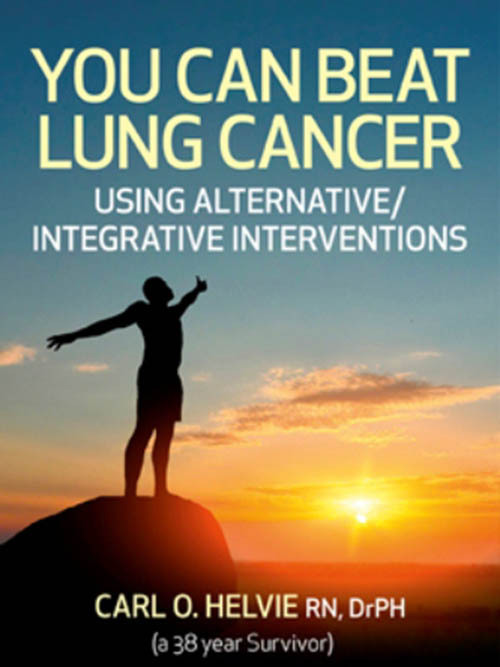 Dr. Carl O. Helvie, however, not only has survived, at the time this article is being written, 39 years after his diagnosis of lung cancer, he continues to lead an active life at the age of 80. Dr. Helvie continues to be a nurse practitioner, an author, a researcher, a radio personality, and a a cancer educator, and doesn't even take any medications. Like many cancer survivors, Dr. Helvie had an inspirational mother. Dr. Helvie wasn't the first member of his family to get a cancer diagnosis. Over 60 years ago, Helvie's mother had been diagnosed with the disease and told she would never leave the hospital. Like more than one mother of minor children, Helvie's mother wasn't going to take the diagnosis lying down. She "had three children at home and had to make sure they graduated from high school," Helvie recounts. There wasn't reason to have faith in medicine, but she had faith in God, and she had a list of things she needed to accomplish. In an era when almost no one survived any kind of cancer, Mrs. Helvie beat the odds. When Helvie himself was diagnosed with lung cancer in 1974, the condition was still considered to be a death sentence. But Helvie remembered his mother's fatith and joined a "Search for God" group. He prayed. He meditated. And he looked for a physician who could use techniques that spared healthy cells while killing cancerous cells. And he made a decision to continue teaching nursing and health students, writing articles, and carrying on research. Helvie also made sense of what was happening. When a friend asked him why, he thought, he had cancer, he responded that it was a gift "in order to now offer help and encouragements to others face with the same diagnosis." And with the help of Dr. Kim Dalzell, Dr. Bernie Siegel, Dr. Francisco Contrerase, and Tanya Harter Pierce, that is what he continues to do. Attaran S, McShane J, Whittle I, Poullis M, Shackcloth M. A propensity-matched comparison of survival after lung resection in patients with a high versus low body mass index. Eur J Cardiothorac Surg. 2012 Oct. 42(4):653-8. doi: 10.1093/ejcts/ezs135. Epub 2012 Apr 19. Kondo T, Hori Y, Yatsuya H, Tamakoshi K, Toyoshima H, Nishino Y, Seki N, Ito Y, Suzuki K, Ozasa K, Watanabe Y, Ando M, Wakai K, Tamakoshi A. Lung cancer mortality and body mass index in a Japanese cohort: findings from the Japan Collaborative Cohort Study (JACC Study). Cancer Causes Control. 2007 Mar.18(2):229-34. Epub 2007 Jan 18.